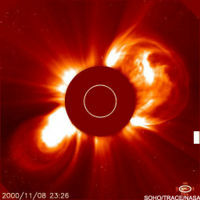 A Solar and Heliospheric Observatory (LASCO) observation of a CME. Coronal Mass Ejections (CMEs) are a direct result of magnetic instabilities (i.e. solar flares) on the surface of the Sun erupting and expelling millions of tons of solar plasma into interplanetary space. CMEs are strongly influenced by the interplanetary magnetic field (IMF). 1 A hazard to settlers? On Earth, we are protected from dangerous high energy particles emitted by the Sun. The Earth's magnetic field acts as an umbrella, deflecting incoming ions and electrons, channeling them to the Earth's poles. This generates magnificent displays of light in polar regions, the Aurora Borialis (over the North Pole) and Aurora Australis (over the South Pole). The light is emitted in the upper polar atmosphere, in the various layers of the ionosphere. Mars does not have the luxury of a protective magnetic field, and does not experience aurorae in polar regions. In addition, the Earth's atmosphere is over 100 times thicker than Mars'. This greatly increases the insulation of the planet from solar energetic particles, magnifying the intensity of aurorae. The Earth's atmosphere has the protective thickness equivalent to 10.3 meters of water, or approximately 3.4 meters of regolith (very important when considering settlement design). The protective thickness of Mars' atmosphere is equal to only about a 27 cm thickness of water. Settlement designers must therefore assume that Mars' atmosphere will not protect settlers from high energy, ionizing particles emitted from the Sun. Warning Mars settlers about the onset of damaging ions is therefore a high priority. Even on Earth, predicting CMEs and dangerous ions is very important as a massive current of global scale is applied during solar storms. This effect can damage delicate satellite circuits, thermally expand the upper atmosphere (thickening the atmosphere in low Earth orbit, slowing down satellites and decreasing their orbital altitudes) and even cause damage to power grids on the ground (auroral electrojets can have the effect of overloading country-wide electricity grids). Methods of predicting and detecting Coronal Mass Ejections are constantly being developed, but the most effective way of detecting the onset of an Earth-bound CME is to have a probe between the Earth and Sun. Currently, Mars has no probe or observatory in the line of sight (LOS) of the Sun, leaving an unpatrolled expanse of interplanetary space for dangerous solar ions to pass unchecked. A possible solution (akin to the Earth's SoHO or ACE observatories) could be to establish a simple and inexpensive solar observatory at the first Lagrangian Point (L1) in the Mars-Sun system. This is a gravitationally stable point in direct LOS with the Sun where a probe can be inserted to orbit around the Sun at the same rate as Mars. This proposed system would provide some warning for Mars settlers of the propagation of solar ions toward the Red Planet. See also: Early warning system. If no such sensors were positioned between the Sun and Mars, interplanetary spacecraft or Mars habitats might be designed to include a sensor that can detect the x-ray burst that preceeds a solar proton event. However, this system would probably only provide a 20-minute advance warning. ↑ Geomagnetic Storms Can Threaten Electric Power Grid - American Geophysical Union article. ↑ The Solar and Heliospheric Observatory (SoHO) acting as an early warning device. ↑ Lagrangian Point on Wikipedia. This page was last edited on 17 December 2018, at 14:51.